What a darling Teddy Bear and teacup. The bars look fabulous and really easy. Time to bake! Uh oh, Kitty -- you've done it now. I'll never lose weight after seeing this recipe. :-D Creme brûlée is my favorite dessert, I order it every chance I get when we eat out. These look wonderful (and decadent). Your teddies are just charming, Kitty; I would love to have those in my home, and I love your beautiful teacup and saucer. They are all such special gifts to treasure! I hope you have a good day, Kitty, and stay warm! Feel the same way- going to be fat forever now, haha. Thanks Kitty- this is actually a great recipe b/c my husband loves friend egg whites and I am often "stuck" with 3 yolks. I always wish to do something with them and don't. NOW when he is in the mood for them I shall plan on making these. I will be as wide as a house in no time. Kidding. I almost always give my sweets away so they're not in the house. My next door neighbors have 4 children whose mother is a teacher, so they always appreciate home made treats, as their Momma seldom has time at this point in her busy life. Hugs. Have a great week, my sweet friend. Yum, yum, yum! 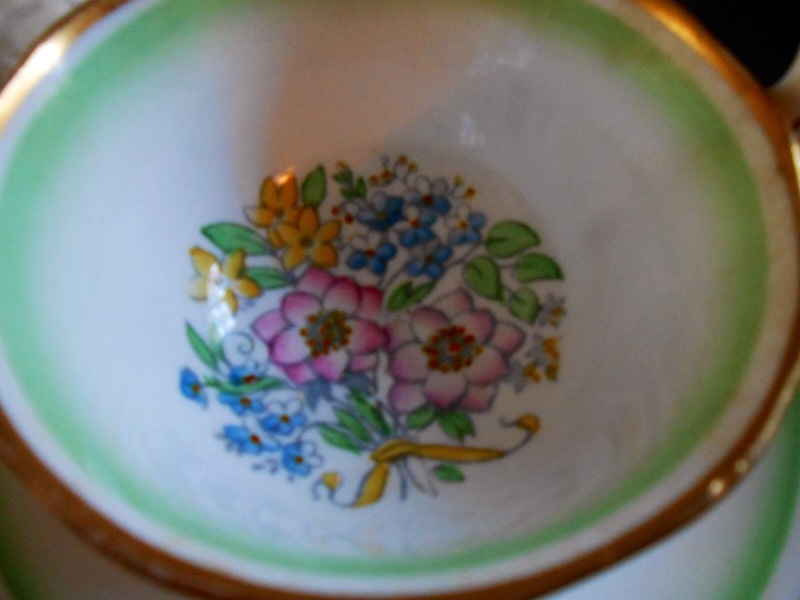 And it has toffee bits :) Your tea cup from your mom is so very pretty! and your teddies are too sweet! May you have a wonderful, joy-filled day, dear friend. Much love to you! Oh my Kitty, do those bars ever look scrumptious! Would love to try them with a cup of tea. I smiled when I saw your teacup bear; so sweet! You know I had a lot of your recipes on my desktop and never got around to printing many of them off. Now they're gone. I will have to start all over again. That's what I get for procrastinating. Thank you, sweet friend, for coming to tea and have a lovely day. Hi Kitty, I love your bears and your beautiful teacup! Your bars sound fantastic too. Have a lovely day my friend! 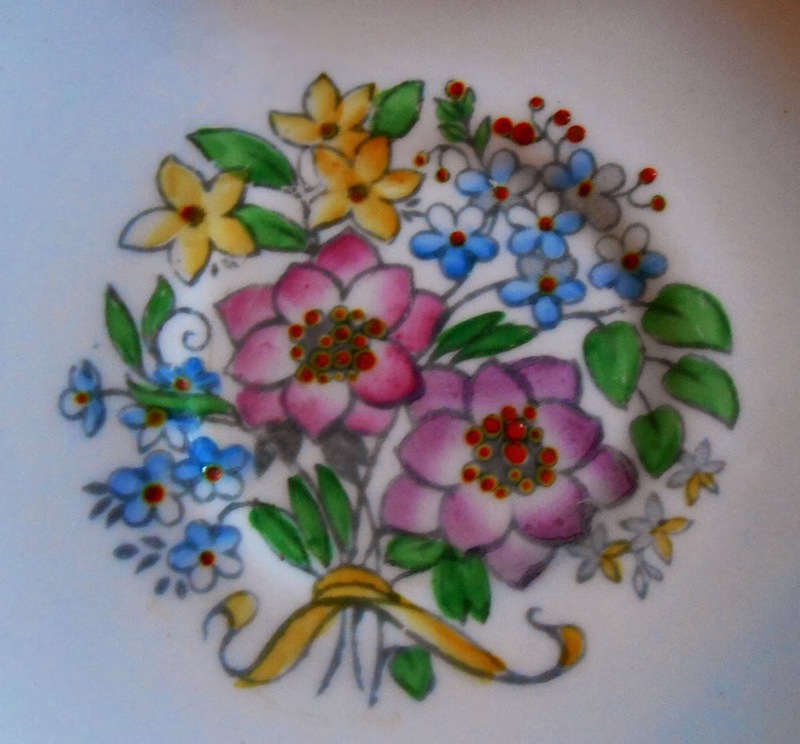 The bears are sweet Kitty, and I like the pink plate your decadent squares are on. Very pretty tea cup and darling bears. It's always fun to have company for tea. Those bars sound absolutely amazing. Perhaps Valentine's Day will mean something special like this. Creme Brulee is my favorite coffee flavor. 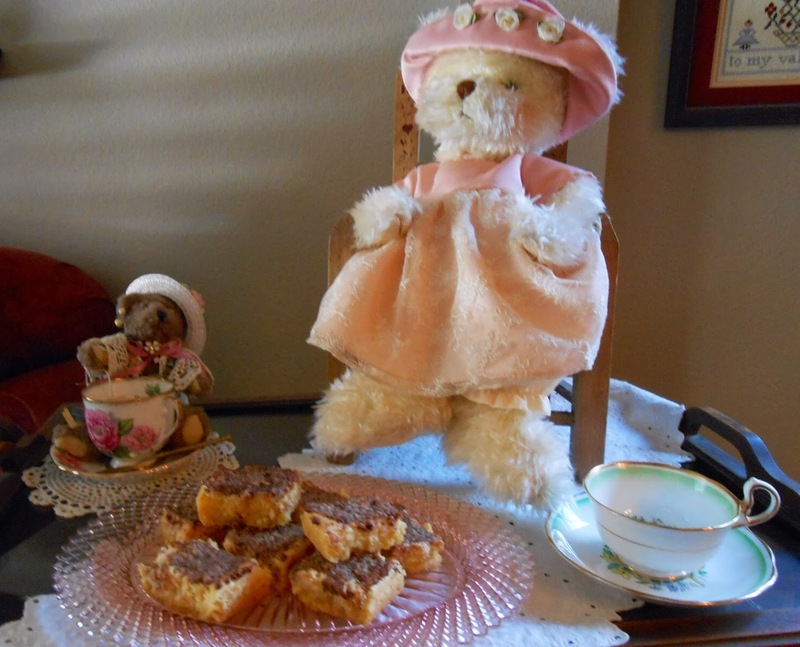 Now I have to make the bars..... And how nice that you are having a Teddy Bear Tea. Love it! Yes - the one your Mom gave you is definitely hand painted! What a darling little tea vignette you have set up with the bears! Lovely recipe too! So glad you shared at Friends Sharing Tea! I can't wait to try these! LOVE Creme Brulee so I know these will be delish. Your tea cup and saucer is beautiful. I used to collect teddy bears eons ago. Ended up giving them to kids. Oh my goodness, that looks divine! I'm in need of it now! 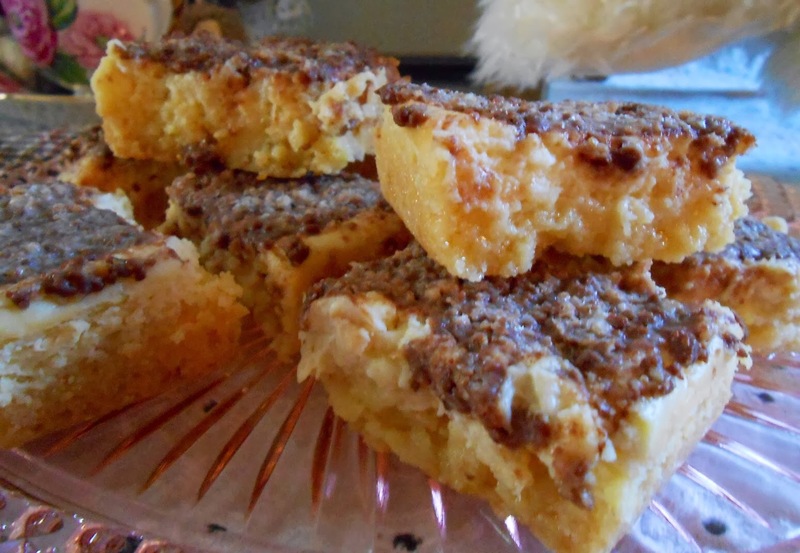 Creme Brulee bars??? Sounds so delicious! I would love one of those! I once had Creme Brulee oatmeal, and it was incredible too. I think it is the Brulee part, lol! what a fun to have a tea party with the bear ladies. They are both too cute. And I see they enjoy the Creme brulee bars as I would do. Sound really yummy. Your china looks wonderful. Thank you for sharing this comfortable tea time. I love the teacup your mom gave you. very pretty. 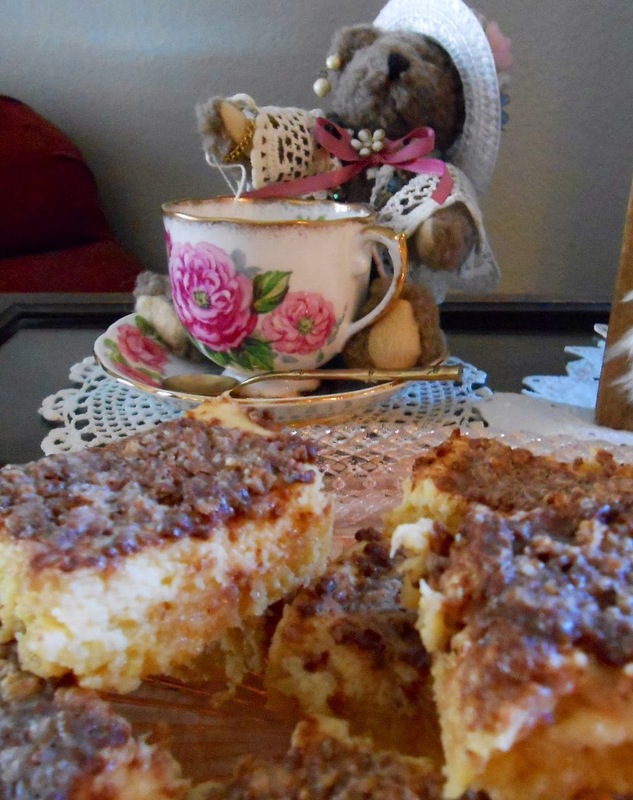 and tea with bears and delicious creme brulee bars -- what could be better?! I knew I shouldn't have opened this...I am trying to cut down on sweets, maybe next week! These bars sound and look decadent. I WANT SOME! I WANT SOME! This recipe and the result is right up my alley. LOVE your gorgeous tea cup too. And the bears you're serving are just adorable too. Oh how I'd love to share some yummy tea and these bars right beside you Kitty. Pinning to make one day soon. Thanks so much for sharing. Kitty, Your bars looks SO good and I love your sweet painted cups! Your tea sipping teddy bar is adorable! I love recipes like this Kitty, they sound so good! Going on my recipe to do list!! I just love that you invited your precious bears to have tea with you. I love Cream Burlee and these bars look awesome! Hope you are staying warm and cozy today with all that ice that is coming our way, yet one more time. Thanks so much for sharing with Full Plate Thursday and have a great weekend! All I can say is, YUM, YUM, YUM! Well and how about CUTE, CUTE, CUTE! Thanks for sharing with SYC. Girlfriend! I am soooo excited this yummy recipe is being shared at Weekend Potluck's party this weekend. I sure can't wait to try these. Congrats to you!! Creme brulee is my favorite dessert, can't wait to try this! Love the teddy bears, my Mom collected them, nice memories! Thanks for sharing.